Enjoy a brand new version of extra cool Japanese logic puzzles - griddlers (nonograms)! The logic it is based on is simple and fun. Simply use the given number keys and unveil the hidden picture. You'll love the splendid interface, the editor for creating new griddlers and the large collection of pre-made black-and-white and colored puzzles. 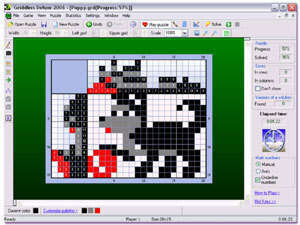 Griddlers Deluxe 2007-6.3 is a shareware program and can be used as a demo to try the software until the free trial period has ended. A full version of the program is available after the trial period ends. For security reasons, you should also check out the Griddlers Deluxe download at LO4D.com which includes virus and malware tests. Additional screenshots of this application download may be available, too.